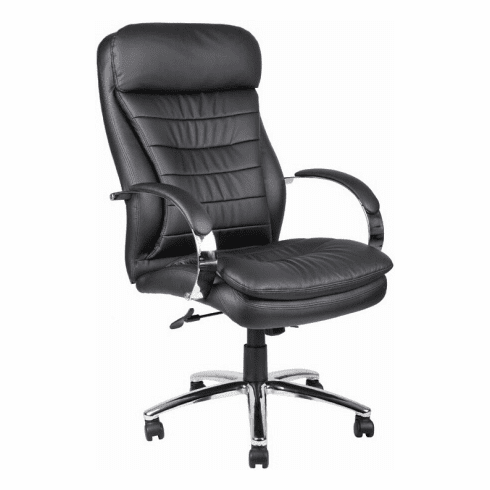 This high back executive office chair from Boss Office Products features thickly padded and properly contoured cushions with an added, extra layer of foam for incredible comfort. Other features include pneumatic seat height adjustment, 2-paddle spring tilt mechanism, which can be locked in any position throughout the tilt range, 360-degree swivel, beautifully upholstered in Caressoft Plus™ upholstery, padded loop arms with chrome finish and a heavy duty five star metal base with chrome finish and dual wheel hooded casters. This high back contemporary office chair meets or exceeds ANSI/BIFMA standards. Caressoft Plus™ is a breathable and extremely durable synthetic material that mimics the look and feel of high end, top grain leather. Matching office side chair also available. Dimensions: Seat Size: 20.5"W x 19.5"D. Seat Height Adjustment: 18.5 - 21.5"H. Overall: 45.5 -49"H x 25.5"W x 32.5"D. Six year limited warranty from Boss. This chair normally ships within 2-3 business days from either our CA or GA warehouse.